IFTTT stands for If This Then That. It’s a service that lets you connect to cloud services and Internet-enabled devices to create some useful automated actions for your online activity and “in real life” (IRL). The possible automated things you can do with IFTTT are really limited only by your imagination. The services and devices you automate keep growing every day. The fact that IFTTT is free means that it’s easily accessible to anyone who has access to a computer and the internet. Here’s a look at what it is, how it works, and how to create a simple weather task to get started. Oh, and they have pre-made applets from the community, too. Services: IFTTT lets you connect your cloud accounts like Gmail, Facebook, Alexa, or Google Assistant. It also lets you connect internet-enabled devices like WeMo plugs, D-Link Wi-Fi cameras, Nest thermostats, mobile phones, and more. Applets: A single automation that you’ve created to connect two cloud services or devices. Applets usually include some form of logic that defines when a specific action will cause a specific trigger. Trigger: An event that causes the applet to become active. This could be an incoming email that has a specific subject line, your mobile phone logging into your home Wi-Fi network or a website RSS feed getting updated with new content. Action: The event that you want to put into motion when the trigger you defined occurs. This could be sending an SMS to your phone, turning on a Philips Hue light, or adding a new row to a Google Sheets spreadsheet. Activity: This is a log in IFTTT that shows all of the triggers and actions that have recently occurred. Ingredients: This is information passed from the “Trigger” event that you can use when customizing the “Action”. These are all of the terms you need to understand to get started building your own automations. 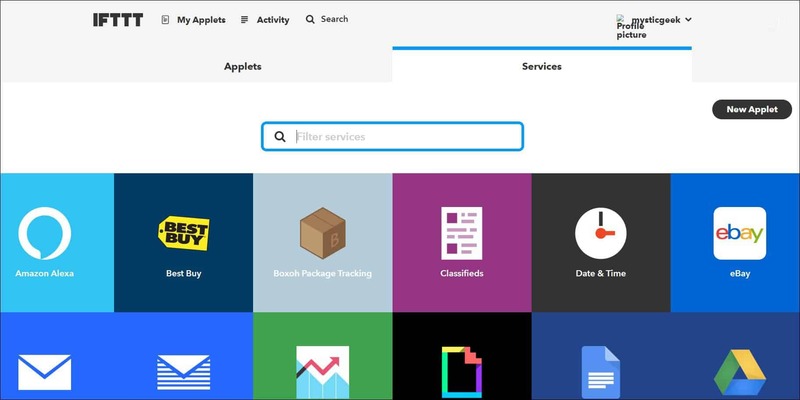 If you want to see all of the services that are available to use on IFTTT.com, just log into your account and click on the Services tab. You’ll see all of the services you’ve already enabled on your account, but you can see all available services by scrolling to the bottom of the page and clicking on All services. As you can see, the possibilities for what you can automate in your life are virtually limitless. Let’s take a look at a simple IFTTT applet and how you’d go about setting it up. If you don’t have any services configured with IFTTT yet, that’s okay. You’ll be prompted to connect your account with that service during the Applet setup process. In this example, you’ll configure an SMS to your Android phone whether the current weather in your area drops below freezing. This will alert you to those times when you need to drive more carefully due to black ice on the roadways. Log into your IFTTT account and click on My Applets, then click on New Applet. You’ll see the New Applet creation page. Click on the “this” link, and then type: weather into the service search field. Click on the Weather Underground service. In the list of triggers, click on Current temperature drops below. Type 32 into the Temperature field, and set Degrees to Fahrenheit. You can set the value to 0 and Celsius if you like. Once you’re done, this step should look like the picture below. 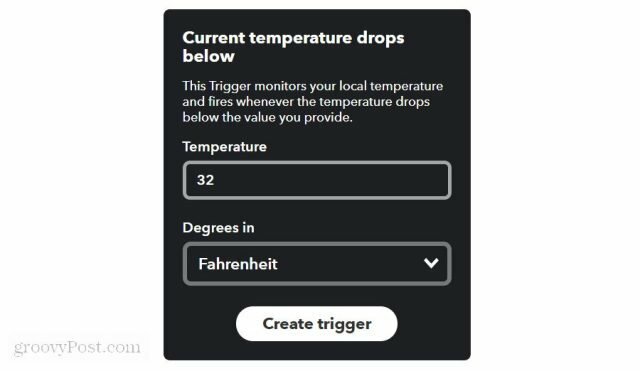 Click on Create trigger, and then continue to the next step, which is setting up the action you want to take when the local temperature hits freezing. Click on the “that” link. Type: sms in the choose action service field. Click on SMS in the services listing. Click on Send me an SMS. In the Send me an SMS configuration window, customize your text alert. At this stage, you can make the alert message say whatever you like. IFTTT also includes ingredients you can insert into the message. The ingredients, in this case, include the current temperature, conditions, an image of current conditions, and a forecast link — all from Weather Underground. Click Create action, and your applet is done! At any stage in the process where you don’t have an account with the service you’ve selected, you’ll be prompted to configure IFTTT with your account details for that service. In the case of an SMS message, you’ll need to provide your mobile phone number. You can further customize security and other settings in IFTTT under your profile. When you’re logged into IFTTT, just click on the dropdown near your profile name, and select Settings from the menu. Profile service: Set your profile to match one of your linked social media accounts. Linked accounts: Link your Google or Facebook account to IFTTT, so if you’re already logged into those accounts on the same browser you won’t need to log into IFTTT manually. Two-step verification: Enable two-step verification (which uses your phone to verify logins) to secure your IFTTT account from hackers. Export data: IFTTT will email you a JSON file with all of your IFTTT data. URL shortening: You can link your bit.ly account so that URLs you use (such as in automated social media posts) will get automatically shortened. Email communication: Enable or disable notifications from IFTTT to reduce email spam. 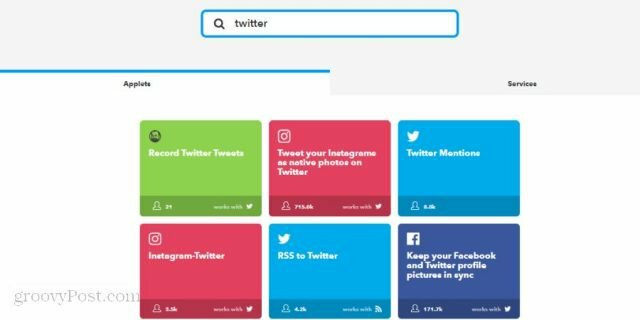 You can search for applets that other users have created and shared with the IFTTT community. This search is easy. Just log into your account and type in the service in the search field. When you press Enter you’ll see a long list of examples of how other users have integrated their various services and devices with that service. If you see one you like, just click on it and click on the Turn on the button to enable it for your own IFTTT account. If using IFTTT sounds exciting to you, why not try to create a few applets of your own? Post RSS updates for any website to your own Twitter account. Enable the RSS to Twitter applet. Receive a mobile notification if your Nest thermostat drops under a fixed temperature. Enable the Nest notification applet. Go to bed when the sun is down. Get a text notification within 15 minutes of sunset in your area. Enable to sunset notification applet. Log your sleep patterns from Fitbit to a Google Spreadsheet. Enable to sleep log tracker applet. Whenever you like a YouTube music video, automatically add the song to your Spotify account. Enable to YouTube to Spotify applet. As you can see, IFTTT is a very powerful automation tool that can touch all of the services and devices you already use. You can easily set up impressive automations once and just forget about them once they start simplifying and automating your life.